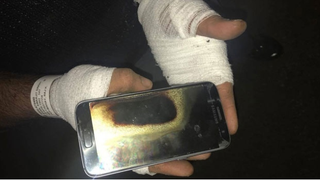 Amarjit Mann told a Canadian news station that he felt his Galaxy S7 phone getting warm in his pocket while he was driving, and when he pulled out the phone, it instantly exploded in his hand. Mann says the explosion caused second-degree burns on his hand and third-degree burns on his wrist. Mann told The Winnipeg Sun that the phone was stuck to his hand before he was able to throw it out of his car’s window. Samsung recently issued a worldwide recall and halted production of a different phone, the Galaxy Note 7, because it was catching on fire and exploding. Samsung tried to offer replacement Note 7's at first, but those kept exploding too. Samsung also had to recall 2.8 million washing machines, because they were hurting people when they fell apart during use. If Samsung has to recall its flagship phone line over fires and explosions yet again, it’s going to set the company’s mobile division back even more. We’ve reached out to Samsung for comment and will update this post if we hear back.